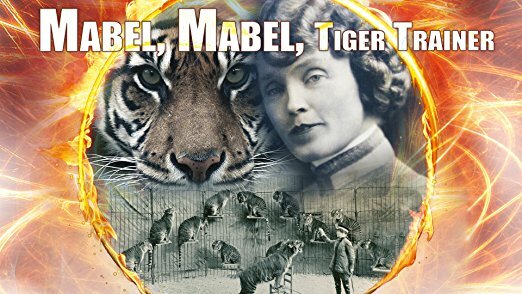 Raised in poverty in Kentucky, Mabel Stark joined the circus in 1911 and became the first woman to train tigers, earning the center ring despite being told that women couldn’t work the big cats. In a 57-year career, she headlined shows with Ringling Bros and Barnum and Bailey, survived multiple maulings and marriages, starred in Hollywood movies, and managed up to 20 cats by forming intimate relationships with each, rather than using the whip. Her life ended tragically just outside of Jungleland in Thousand Oaks, CA, and her legacy and the golden era of the American circus is recounted by former animal trailers, performers and historian Janet Davis, with Mabel’s voice, from her memoir “Hold That Tiger”, provided by Oscar ®-winner Melissa Leo. MABEL, MABEL, TIGER TRAINER is written, produced and directed by Leslie Zemeckis (BEHIND THE BURLY Q, BOUND BY FLESH) and produced by Sheri Hellard, Jacqueline Levine and Robert Zemeckis.